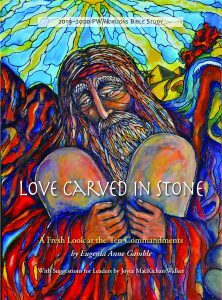 Welcome to the 2019–2020 Presbyterian Women/Horizons Bible study, Love Carved in Stone: A Fresh Look at the Ten Commandments. What would it mean to consider the Ten Commandments not as a harsh list of what not to do but, instead, as a “love letter” from a loving God? A fresh embrace of the Ten Commandments (or Words), author Eugenia Gamble suggests, may ultimately contribute to the restoration of ourselves and our communities and the furthering of the gospel in the world. “Moral behavior matters, not simply because immoral actions can anger or disappoint God, but because principled behavior is how love becomes real, both toward God and in community.” Love Carved in Stone is a Bible study that helps us reframe the way we look at and live in the world. Each lesson begins with an exploration of one of the Ten Words in its biblical context. From there we consider a moment from Jesus’ life that shows us how he lived out that Word. We then consider the Word for our own lives and contexts. We conclude with an invitation to pray with the Word in our circles or study groups and in our personal devotions. Additional helps in Horizons magazine beginning with the July/August 2019 issue. 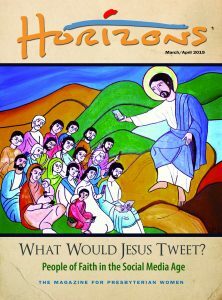 Horizons magazine subscriptions — Call toll-free 866/802-3635 or subscribe online.